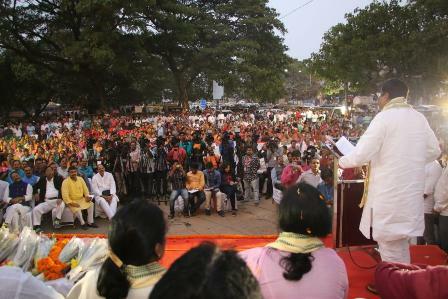 ONI Bureau: While welcoming former IAS Aparajita Sarangi to BJP, Union Minister led the charge against Odisha Government at a huge gathering at the party office in Bhubaneswar, saying Chief Minister Naveen Patnaik has miserably failed the people of the State in the last 18 years. 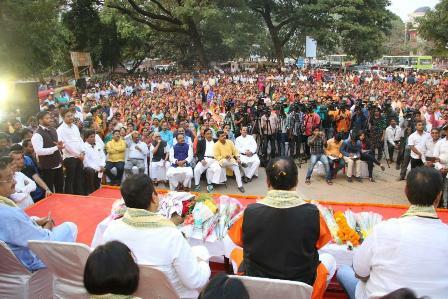 “The Naveen era has seen corruption reaching its peak, due to inefficient leadership and corrupt administration. PC (Percentage Commission) culture is rampant and development work has been hindered,” he alleged. “In 2015, the PWD (Public Works Department) code in Odisha was changed by the Naveen Government, which ensured no tender process for Government contracts up to Rs 5 lakh. Earlier, the limit was Rs 50,000. The new process led to widespread corruption at the block level under the aegis of ruling party politicians and officers,” said Dharmendra Pradhan. Dharmendra Pradhan launched a scathing attack on CM Naveen Patnaik, saying the Water Resources and Works departments which remained under the control of the Chief Minister for a long period, witnessed massive corruption. “Contracts were handed over without any legal tender process. He is directly responsible for corruption in all departments, as he allowed things to happen,” said Dharmendra. “Under the non-planned budget of the State, contracts worth Rs 10,000 crore are being handed over to BJD workers without any tender process. The Prime Minister was right when he said, ‘isi PC ke wajah se log peeste ja rahe hain’. Is it 3T (Technology, Transparency, Teamwork) of Naveen Patnaik to distribute contracts without tender?”, he asked. Dharmendra Pradhan also lashed out at CM Naveen Patnaik on the issues of tree felling for beer factory and excess on protesting women at Balarampur in Dhenkanal district. He also came down heavily on the government over the sexual exploitation of inmates at a shelter home in Beltikiri in Dhenkanal District. Taking a dig at Naveen Patnaik’s decision to distribute 70 lakh smartphones among the SHG women workers, Dharmendra asked the CM to provide toilets to women, which they desperately need to protect their honour and dignity. “Odisha remains at 29th in the country in terms of building of toilets,” he said. 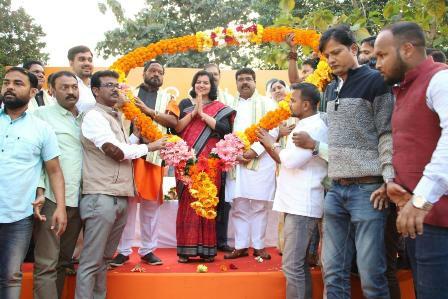 Hailing Aparajita Sarangi as a clean and honest officer, Dharmendra said the followers of Narendra Modi would take Odisha on the path of growth and development in the coming days.